Welcome to the second installment of Frappuccino Fridays! If you haven’t yet heard, I’ve teamed up with my culinary soul sister, Lisa, for this new series, which will feature our own veganized versions of Starbucks frappuccinos. 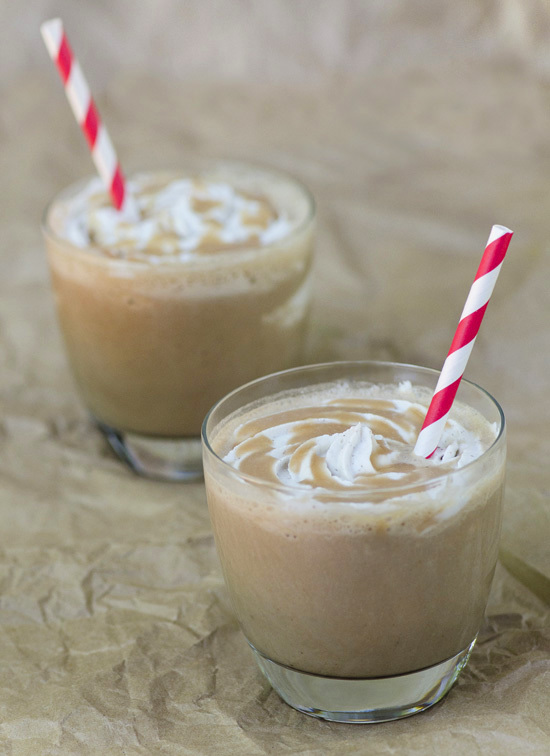 We’ll be posting a new homemade frappuccino recipe every Friday all summer long! Lisa and I will be alternating back and forth each week, so be sure to check back as we recreate all those tempting items on the Starbucks menu. Think Peppermint Mocha, Cinnamon Dolce, Chai Crème and Pumpkin Spice—minus the unidentifiable ingredients and chemical sweeteners. Last Friday, Lisa shared her version of the Java Chip. Today, I bring you Caramel Brulée. This delectable treat is Starbucks’ most popular blended beverage, and it’s not hard to see why. This frappuccino flavour is bold but easy-drinking. The homemade caramel sauce and sweet Medjool dates lend a distinct buttery sweetness, and the fluffy swirl of coconut whipped cream adds just the right touch of decadence. This drink most definitely shouts “indulge yourself.” Enjoy! To make the coconut whipped cream, scoop the cream from the top of the can of coconut milk, reserving the water at the bottom of the can for other uses. To make the caramel sauce, blend all ingredients in a high-speed blender until smooth. To make the frappuccino, blend all ingredients in a high-speed blender until smooth and frothy. To serve, pour the frappuccino in a tall glass, top with coconut whipped cream and a drizzle of remaining caramel sauce.